Cup of Coffee 9/4: It was a night of low-scoring games for the affiliates, as Salem was the only team to score more than four runs, putting up nine in a blowout win behind a banner day from Luis Alexander Basabe (pictured). A strong performance by Sean O'Sullivan led Pawtucket to victory while struggles from Kevin McAvoy and Roniel Raudes ended in a pair of losses. The DSL Red Sox1 won the first game of the DSL finals in an exciting walk-off win in the 14th inning. Starting pitcher Sean O'Sullivan led the PawSox to victory with a strong performance on Saturday night. O'Sullivan tossed 5 1/3 innings, allowing one run on four hits and three walks while striking out eight. Roman Mendez tossed 1 2/3 innings of shutout baseball before turning the ball over to Austin Maddox and Heath Hembree for a scoreless frame each. The PawSox bats drew first blood in the third inning, when Jose Vinicio and Rusney Castillo each doubled to start the inning. Pawtucket's only other run came via a fifth-inning RBI single off the bat of Ryan LaMarre, scoring Castillo. Kevin McAvoy didn't turn in his best effort on the hill on Saturday night but he was able to go the distance. The right-hander tossed eight innings, giving up five runs (four earned) on eight hits and two walks, striking out two. After falling behind 5-0 early, the Sea Dogs pushed their first run across the plate on an RBI groundout by Mauricio Dubon to score Danny Bethea. Nate Freiman was responsible for Portland's second run as he homered to lead off the seventh inning. The Salem bats put on a clinic on Saturday night, starting the action with a two-run blast by Jordan Betts in the second inning. The Red Sox proceeded to explode for five runs in the third inning. After loading the bases to begin the inning, Salem came through with an RBI single by Nick Longhi, a two-run single by Jose Sermo, and RBI singles by Jordan Procyshen and Jayce Ray. Luis Alexander Basabe, playing in just his third game with Salem, went 3 for 5 with two doubles, two runs, and an RBI. Daniel McGrath lasted 5 1/3 innings on the mound, allowing two runs on four hits and two walks while striking out a pair, bringing his ERA to 4.11 and picking up his eighth win of the season. Bobby Poyner picked up his fourth save with a solid relief performance, tossing 3 2/3 shutout innings and allowing one run on four hits while punching out three. The Drive fell behind early after a shaky final start for Roniel Raudes, who allowed four runs (one earned) on three walks and four hits in just 1 2/3 innings. Austin Glorius was strong in relief, going 4 1/3 innings and allowing no hits or runs while walking three and striking out four. Stephen Nogosek threw two shutout innings to close out the game. Greenville's only run came on an RBI single by Derek Miller to score Nick Lovullo in the fifth inning. Miller, Tate Matheny, and Tyler Spoon were the only Greenville players to collect hits. The Spinners picked up the first run of the game on an RBI single by Isaias Lucena in the second inning. However, starting pitcher Kevin Steen was unable to preserve the lead as he allowed two runs on four hits and three walks in 5 2/3 innings pitched. Matthew Gorst allowed two more runs in 2 1/3 innings of relief, striking out three and walking one. 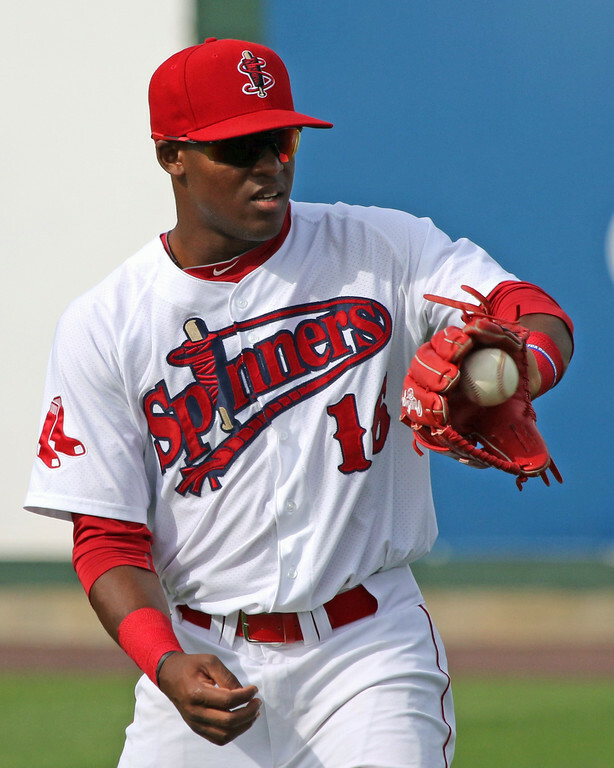 Left fielder Matt McLean, Victor Acosta, and Carlos Tovar led the way for the Spinners' offense, each going 2 for 4. After five scoreless frames to begin the game, the GCL Sox finally busted out with three runs in the sixth inning. They loaded the bases with one out to begin the inning, then pushed runs across the plate on Santiago Espinal's two-run single and an RBI single by Jagger Rusconi. A seventh inning single by Steven Reveles, which scored Lorenzo Cedrola, extended their lead to four. Starting pitcher Jhonathan Diaz was superb in five innings of work, allowing no runs on two hits and two walks while fanning six. Hildemaro Requena followed him with four innings of work, allowing the GCL Twins to climb back into the game with a three-run eighth but ultimately preserving the lead. The DSL Sox won the first game of their finals series with the Rangers in thrilling fashion, walking off in the 14th inning. Ivan Houellemont came through with the big hit, driving in Luis Hernandez with a single. Right fielder Marino Campana was the only Red Sox player with multiple hits, going 2 for 6 with a triple and a run. Edilson Batista turned in a solid start, allowing two runs (one earned) in 4 1/3 innings, but the bullpen really stood out in the marathon win. Ramses Rosario went 5 2/3 innings, allowing just one run and Carlos Cortes tossed 3 2/3 shutout frames to pick up the win. Player of the Night: Luis Alexander Basabe is doing well to close out his season in style. After a brilliant second half in Greenville, he earned a promotion to Salem for the last five games of the season. On Saturday night, playing in his third game in Salem, Basabe went 3 for 5 with two doubles, two runs, and an RBI from the leadoff spot in the order. Basabe is now 6 for 12 with two doubles and a triple since joining the Red Sox after hitting .258/.325/.447 in 105 games with the Drive.